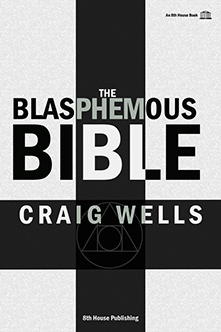 8th House Publishing is proud to announce the advance sales launch of Craig Wells' "The Blasphemous Bible". Due to high demand, we are allowing our customers to reserve copies before the official launch in April. 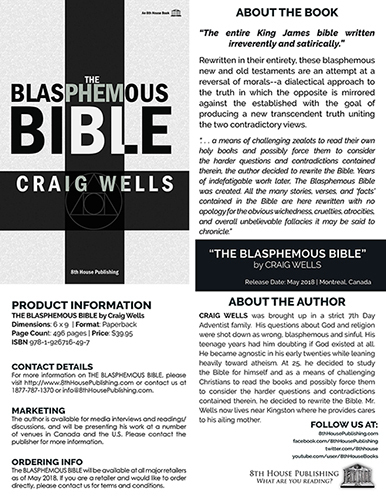 Rewritten in their entirety, these blasphemous new and old testaments are an attempt at a reversal of morals--a dialectical approach to the truth in which the opposite is mirrored against the established with the goal of producing a new transcendent truth uniting the two contradictory views. "The entire King James bible written irreverently and satirically."" The book will be officially released in April and is now available for pre-ordering. Find out more on the book or about the author. Watch the promo video. Pre-order your copy today and get free shipping! God's Wife and the Synonymous X - Released! 8th House Publishing is proud to announce the release of Jesse Chase's first novel, "God's Wife and the Synonymous X'. "God’s Wife and the Synonymous X", Jesse Chase's first novel follows the protoganist on his search for a new cultural and literary theory. Finding all of history and culture appropriated by imperialist and racist perspectives inimical to his own self, he must construct his own program of decolonization and dismantle the philosophic mindspace of the inhuman ideologies and oppressive technologies he has inherited. "A brave, fresh work that champions an ethics of self-recovery and rehabilitation of personal narrative in a world of masks, capitalism and oppression." 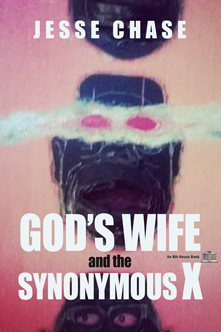 God’s Wife and the Synonymous X is the first in a series of three books in different genres: (1) a novel, (2) a book of critical, cultural and literary theory as an assassination attempt on philosophy and the hegemonies; of cultural appropriation by inhuman ideology and oppressive technology, and (3) a treatment of the process of the making of the first two books; as these literary processes are an experiment in the ethics of self-recovery, and recovery of personal narrative in a world of masks, capitalism and oppression. 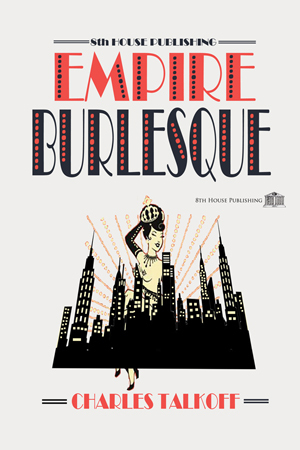 8th House Publishing is proud to announce the release of Charles Talkoff's latest novel, "Empire Burlesque". The first novel in an upcoming trilogy, "Empire Burlesque" is an attempt at reaching a realism with modernity, finding a continuity in fractured timelines and significance in chaos in a world in which these very things--realism, continuity and significance--have been deconstructed and possibly destroyed. In this "Empire Burlesque" of modernity, many things occur in the novel (life) with no apparent significance until imbued with meaning by the subject (us) and narrative authority (authority) itself is assailed by arbitrary, chaotic and decentralizing forces. 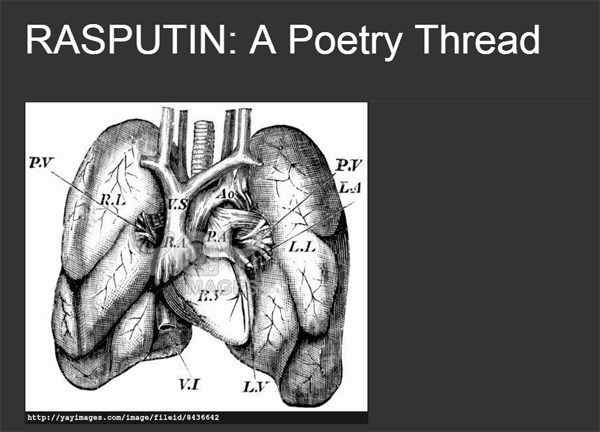 This means the plot (political framing) to the extent one exists, may be ignored or contradicted and information might arrive to intrude into the narrative for no apparent reason and with no obvious connection to the events in the story. Welcome to the modern, schizoid, fragmented,unhinged burlesque empire that the West has become where Trumpian characters define reality and distort reason. An existential detective story with Theseus and the Minotaur as characters, taking on the many forms of man versus beast, citizen versus state, liberty versus control, "Empire Burlesque" renders our modernity with all its farcical, Faustian fog. 8th House is going to China! 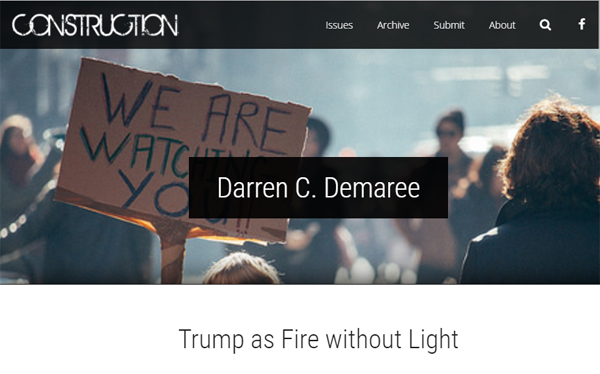 Trump as Fire Without Light by Darren C. Demaree featured in RASPUTIN: A Poetry Thread. Read it here. 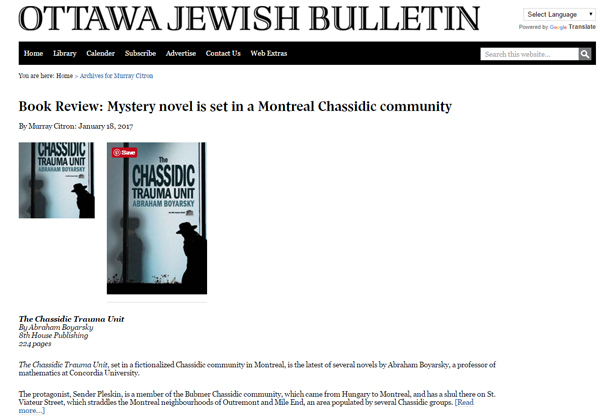 The Ottawa Jewish Bulletin Reviews "The Chassidic Trauma Unit"
Murray Citron of The Ottawa Jewish Bulletin reviews Abraham Boyarsky's "The Chassidic Trauma Unit". 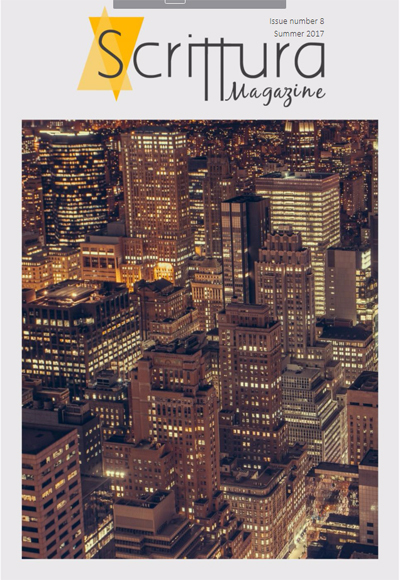 Read the full review online. 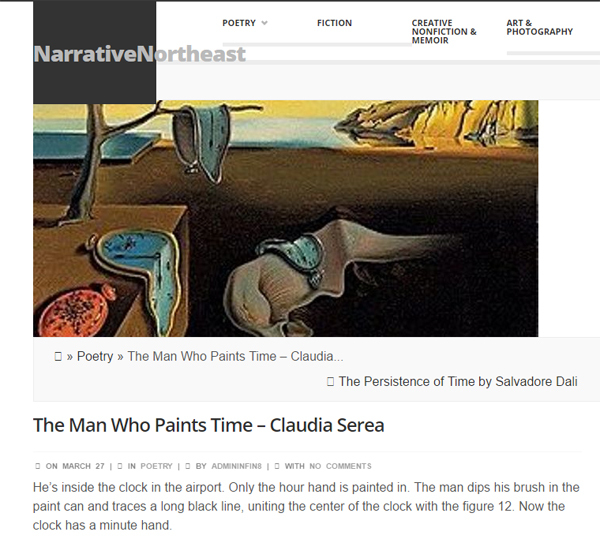 Read The Man Who Paints Time by Claudia Serea in the NarrativeNortheast. 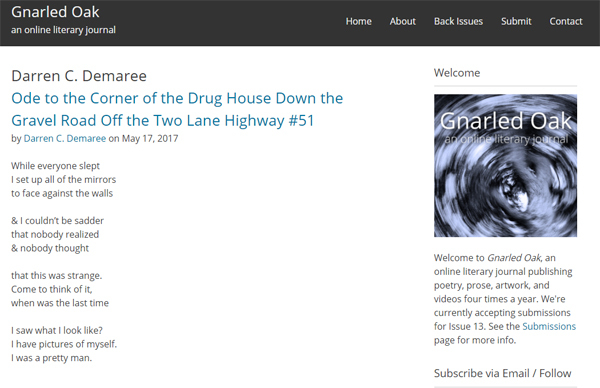 Read Darren C. Demaree's Ode to the Corner of the Drug House... on Gnarled Oak. 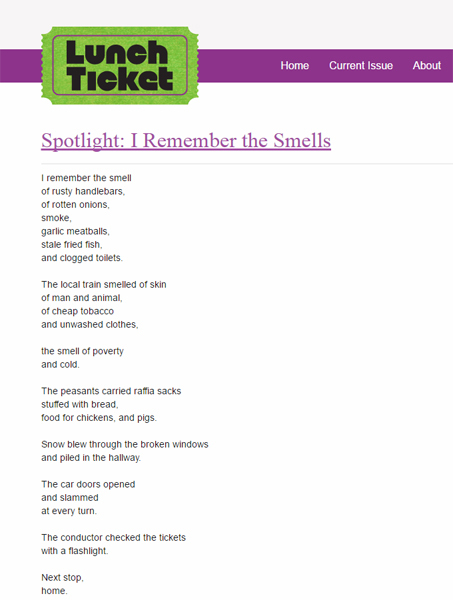 Those of us who know his poetry don't see much of his prose about. Here's a chance! 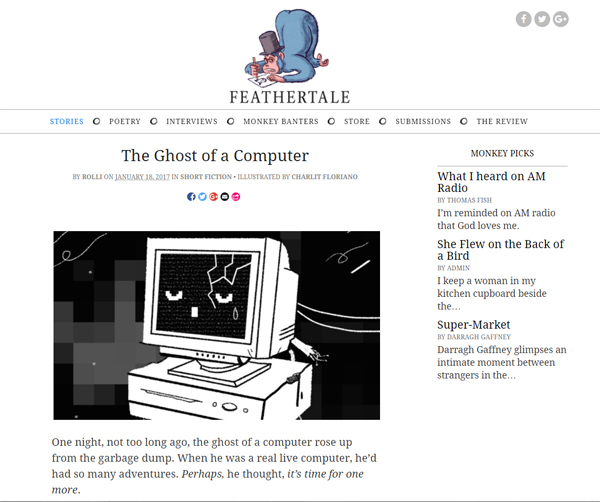 Read Rolli's "The Ghost of a Computer" at Feathertale. 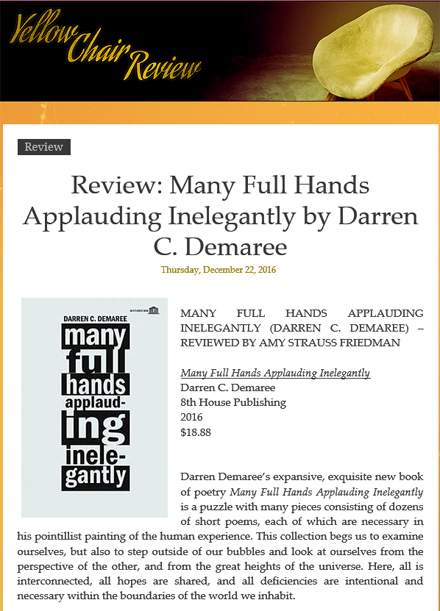 "Darren Demaree’s expansive, exquisite new book of poetry Many Full Hands Applauding Inelegantly is a puzzle with many pieces consisting of dozens of short poems, each of which are necessary in his pointillist painting of the human experience. This collection begs us to examine ourselves, but also to step outside of our bubbles and look at ourselves from the perspective of the other, and from the great heights of the universe. Here, all is interconnected, all hopes are shared, and all deficiencies are intentional and necessary within the boundaries of the world we inhabit." 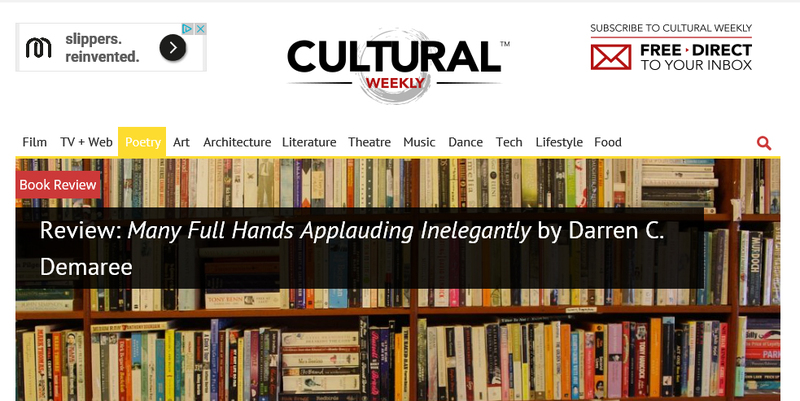 ELSiEiSY reviews "Many Full Hands Applauding Inelegantly"